With the modern stance developing with the increased need for movement, and making use of the hands to make reflexive saves at the higher area of the net, two distinctive styles haves started to stand out. The varying stances will be described and evaluated next: the Y style popular in Europe and the X stance, popular in Australasia, have become the main variations of the standard stance. 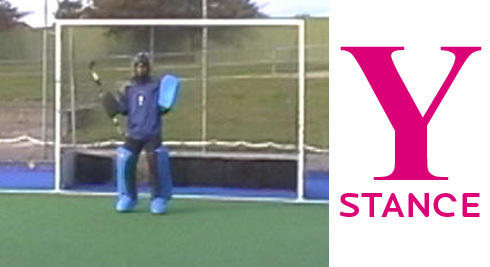 Popular in parts of England and Europe (as well as globally throughout the worldwide hockey community in North and South America, India and Pakistan, Malaysia, Russia and the Africa’s), the Y stance has the legs placed together, or not too far apart, with the hands apart, making a Y shape with the body. This creates a blocking barrier; the pads closing off the space, preventing the ball squeezing through the legs, during movement and the hands supporting the coverage of mid-height shots (placing the gloves at around stomach or hip height). With the body bunched up, the goalkeeper has to react reflexively to shots as they face them. Depending on your preference and the type of shot faced, you could place your hands higher up, within the upper x shape, although most goalkeepers who use a Y stance prefer to have their hands in tight, reacting to each shot as it is released. This allows them to move their gloves into the save as the ball arrives; using their reflexes to make the stop, rather than relying on their positioning, which is helpful when the player disguises a difficult shot, like a reverse hit, which forces the keeper to react instantly once the shot is released. Just like in soccer, with the gloves lowered, it is easier to dive into low saves, as the hands are already in position for the shot (not having to drop the gloves as you dive to move into the save), whilst making it easier to cut off the shooting space of a low shot when stepping out on the play to close down a shooter. Made popular in Australia, with input from the likes of Stephen Mowlam (), the modern X stance has the legs in a wider stance, related to the shoulder-wide positioning in the common stance; the arms pushed out as well, creating an X shape. This gives the goalkeeper quicker movement around their D, and allows them to move their hands into the save, rather than expecting to make saves via reflex reactions (not having to launch into the saving motion). The hands are raised and outside of the body, giving the goalkeeper greater ability and pro-activeness in moving into all saves against raised shots with the gloves. The gloves raised like this give the goalkeeper a better chance dealing with the incredible drag flicks possible at the highest levels, such as those of Taeke Taekema, and the stance giving greater push into aerial saves. Depending on the height of the ball (i.e. a lob/penalty flick or high flick in a penalty corner situation), the hands are raised above the chest, at shoulder height or more, pushing them further out as necessary to cover the open sides of the goal. Unlike the Y stance, the goalkeeper has less distance to reach out to; using their reflexes wisely against shots they would otherwise miss, making use of the extra reaction speed to move into the save if they see the ball at the last minute, palming away the ball to safety on the play. With the legs spaced further out, it is also easier to move around, as you are already and the distance provides an increased lateral push, as well as moving into low shots wide of the body, as they are nearer to the shot (rather than with a closed leg stance); giving greater extension as you can push into a reaching leg save or split. 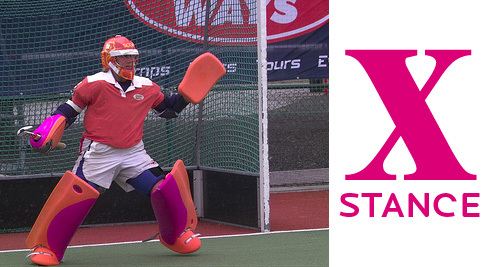 The X stance is also gaining followers across the globe, like Canada’s Mike Mahood, and is fairly popular with the Spanish keepers (influenced by the national goalkeeper coach Martin Drijver), like Fransisco Cortes (Spain’s no 1 who plays his hockey for Club Hockey), who uses a spread out X shape during open play, as seen in the recent Olympics. There is also a European variation of the X stance, as used by Guus Vogels (the famous world class Dutch goalkeeper who has recently retired from international play) where the raised hands are placed outside the body, replicating the symmetrical X shape, but they are closer to the body. WOW! Just hit me, that your game isn’t until today. I definitely needed to get to bed I was so tired when I wrote that post that it didn’t even hit me that it was midnight so the date had changed. I’m doing really bad today, wrong post!